Welcome to what aspires to be a frequently updated hobby blog: here I will try to document my progress as I rediscover the pleasure of painting and basing plastic toysoldiers. Some brief background, for anyone interested: I have been playing wargames for nearly a quarter of a century now, starting with Heroquest and Space Hulk and then moving on to Warhammer Fantasy and, since its untimely death, the 9th Age. Over these years I have accumulated many miniatures, and a good amount of them sit in boxes, unpainted. I rarely got to paint, and even then it was in preparation for a FLGS even or a tournament that required having a painted army. Tabletop quality (or, as Mike Walker in the WD of old used to say: looking good enough...from 3 feet away...with the lights turned down...if you squint hard enough) is what I've always gone for, this is not the kind of painting blog filled with NMM tutorials. That doesn't mean, though, that I am not looking for ways to improve my painting , or that basecoated miniatures washed with Devlan Mud is all that you'll find here. The plan is to set painting goals throughout the year, and try to get as many of them accomplished. The first task is painting an Empire of Sonnstahl army. This is intended as a Christmas gift for my brother, who has spent far too much time collecting and converting miniatures and not enough time putting paint on them! The list of models available also includes 60 more militia, 20 Handgunners, plus more characters and unbuilt boxes of troops, but I decided that the above would be a good basis for him to get started once more, hobby-wise. The plan is to use muted, earthly colors, with hints of red as a connecting motif. Bases will be classic battlefield mud/grass look, with the odd fun element here and there. My photography skills are inexistent, and the current light conditions in Brussels are far from ideal. The photo lens has a way of being brutally honest, too; I've noticed at least 5 spots that need some touching up. But they should look fine on the tabletop! The post was edited 5 times, last by SmithF ( Dec 22nd 2017, 10:37pm ). This topic reminds me of Harry from warseer. Hopefully this means you'll paint as much too. 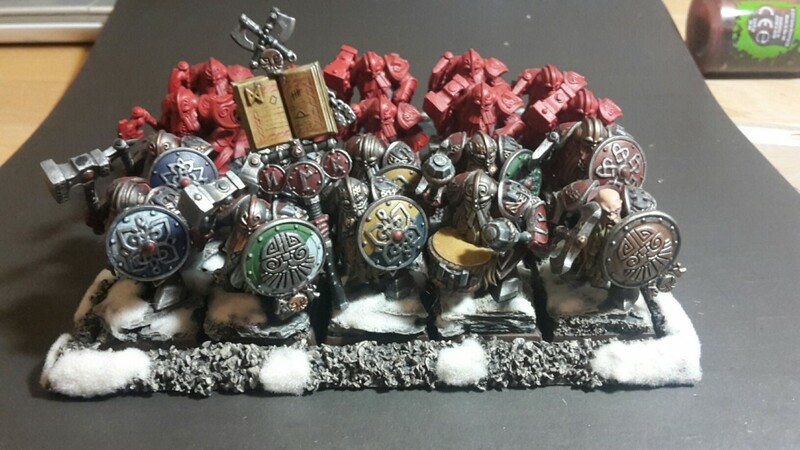 take one of your old GW army books, open it to the first side put your models on one side and use the other as background. the dull colors are perfect, puts the focus on the models. Just put a lamp above and you're set. Not as Good as a light box but an easier aproach. I actually found myself thinking about that awesome log some days ago, and that's what motivated me to start mine! I won't be as prolific as Harry, that I can assure you. But hopefully I'll keep a steady painting rate. Which brings us to an update! I've been painting more Reiters! 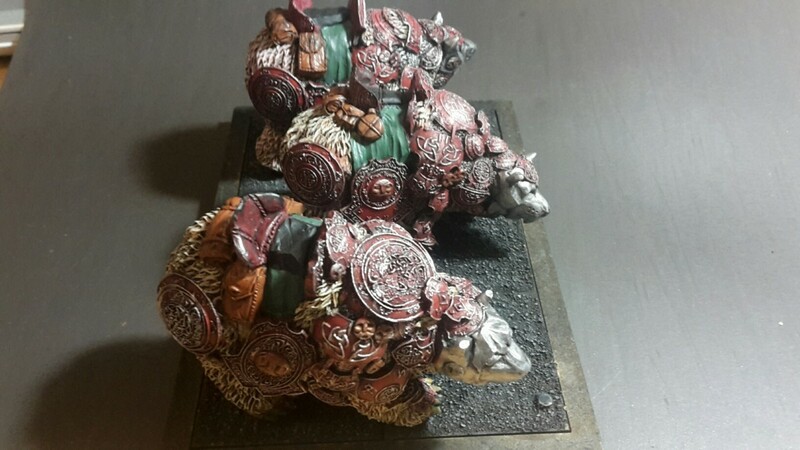 A first unit (the riders were painted long ago, hence the glossy finish; at the time nobody told me I had to shake the washes before use. Doh!). I'll have to go back and paint the hats and feathers, as well as pass a second coat of matte wash.
And a second unit, it still needs some shading on the horses but it shall do for now! Snowy evenings means that some more painting is done! So I also had a painting evening tonight, I completed the first coat of the lavaeffect on six immortals... your way of painting is waaay faster...!! Great improvement of your photo-quality btw...! The guy in the back with the darker colours is a kitbashed knight, to complete the unit of 5. He kind of reminds me of the Hound from GoT. I won't be touching the banners, this is a job for my brother once he receives his army. @Nordheim : thanks for your comment. I find that spending many afternoons painting the same model is not for me, as I like seeing the progress and being able to put the models on the table relatively fast. With my sylvan elves I'd paint batches of miniatures simultaneously, then go back and correct errors/paint details before every tournament. The advantage of the washes is that with controlled use (ie not dumping the entire model in Devlan Mud) you get a pretty solid result with just minimal additional highlighting. On a side note, I'll try to magnetize the entire army, since taking 200 models out of their boxes and into their movement trays is often enough to deter people from getting a quick game in. I've ordered rare earth magnets and about 36" of green stuff, that should do the trick. Next up: I'll be touching up some of my brother's old sword and board infantry! Small update, with something different! 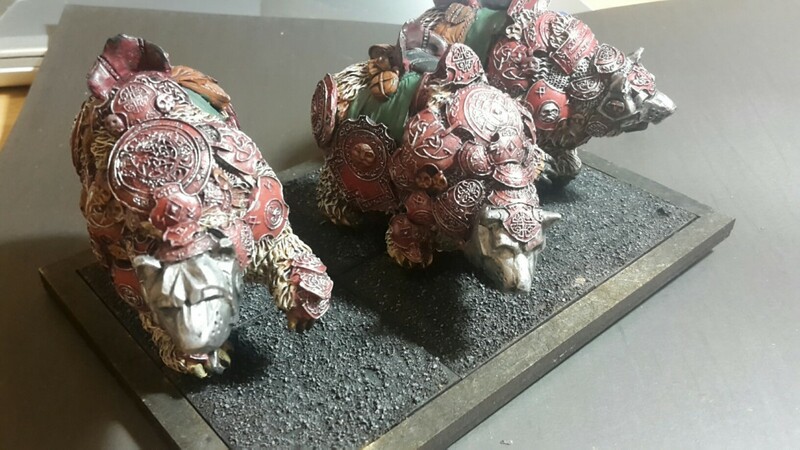 These Scibor Bear riders have been sitting on my painting station for quite a while now, waiting for the right weather to get primed. This afternoon I was able to do so, and I couldn't resist the urge to get some paint on them, too! 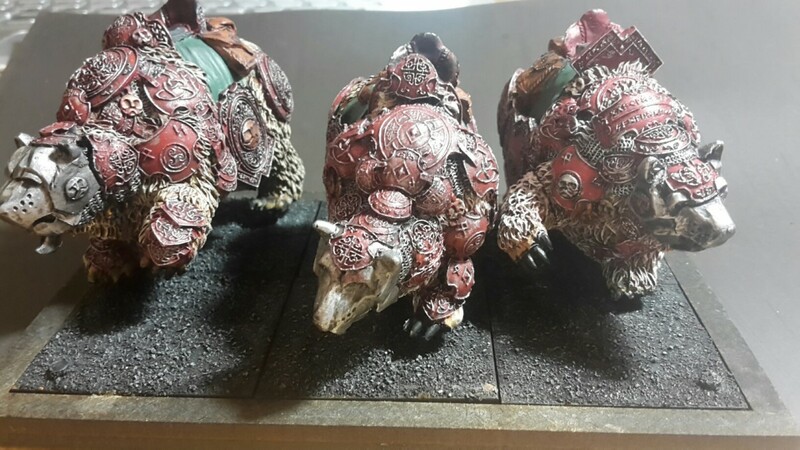 Overall, Scibor bears are great sculpts, very detailed. The fur has a lot of texture, which made drybrushing easier.My only gripe is the face mask/helmet, which I find doesn't have any detail at all. I tried different washes on it, settling for a blueish hue to make it stand out a bit. I scoured the internet for a good recipe for polar bear fur, but I couldn't find anything that I liked. So I opted for a yellowish hue, starting from Balor Brown, Griphon Sepia wash, then several layers of drybrush with mixtures between Skull white and Balor brown. I think the end result looks natural enough, and the fact that I only have to do this for two more miniatures kind of makes the time spent acceptable. Nice. I can see a steady progression. Thanks for your comments so far, guys! It really helps, seeing that people are interested (even though the "user blogs" section is probably the least visited on this site). It has been a productive weekend, hobby-wise! 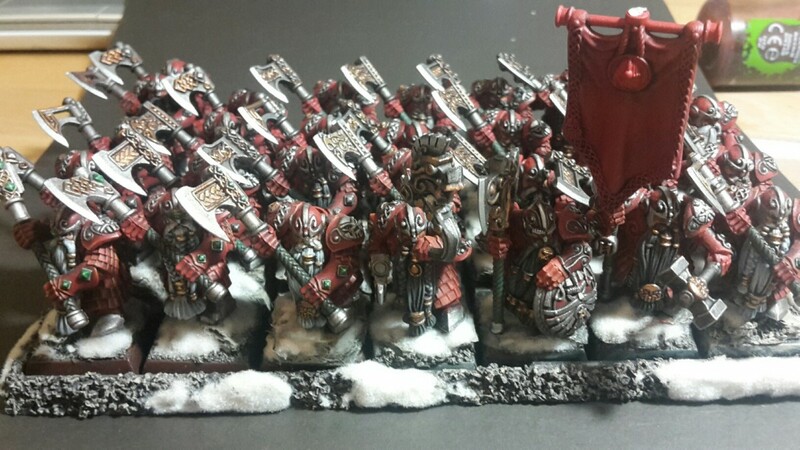 First off, a unit of halberdiers, made from Bretonnian Men-at-arms. These had been basecoated by my brother ages ago, so I touched up some details, settled for a creamy white colour for the "shawl" part of the uniform and highlighted/washed the miniatures. After taking these pictures I also based them. They are supposed to be part of a witch-hunter's retinue, which is why they've all been modelled with neck-guards, to protect against vampires' fangs! After taking the photo I noticed the smudge on the musician's face and the fact that I didn't paint the horn, so I should do that! The banner will be painted along with all the other ones by the army's owner. For the shields we've got a bunch of the old Bretonnian Decals, as well as some Black Templar decals from WH40k. These should look fine on the black background. A Prelate holding twin hammers, and a marshal with a great weapon! awesome, That's a cool Marshall!! Nice. Which sword arms did you use, the regular m@a sword arms? Did you have y buy more of them? Most of them came from the M@A box, if I remember correctly (bear in mind that the two units seen above were made by combining 3 boxes of M@A). However, there are at least a couple of weapons originating from the empire free company box. And, speaking of conversions, here is another unit: Imperial Guard kitbashed by combining Free Company greatswords, pistolier heads and torsoes and swordsmen/militia legs. All credit goes to my sibling, who is a far better converter than myself. The poor standard bearer lost his hand before the taking of the picture (freak accident). I haven't settled on a uniform colour yet, so for the time being black with subtle grey highlights will do. 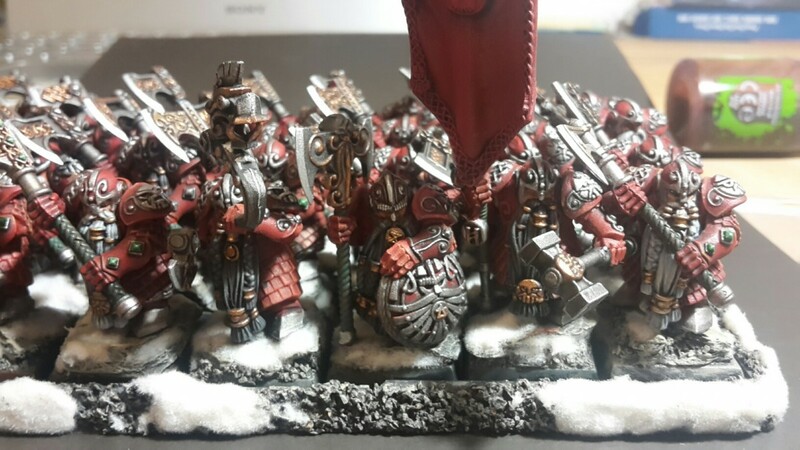 The following spearmen had the same treatment: metals, flesh, leather parts and feathers done, the uniforms will have to wait for when the army's owner settles on a theme. The army is rapidly coming together, I've got to say that the models look quite good when bunched together. 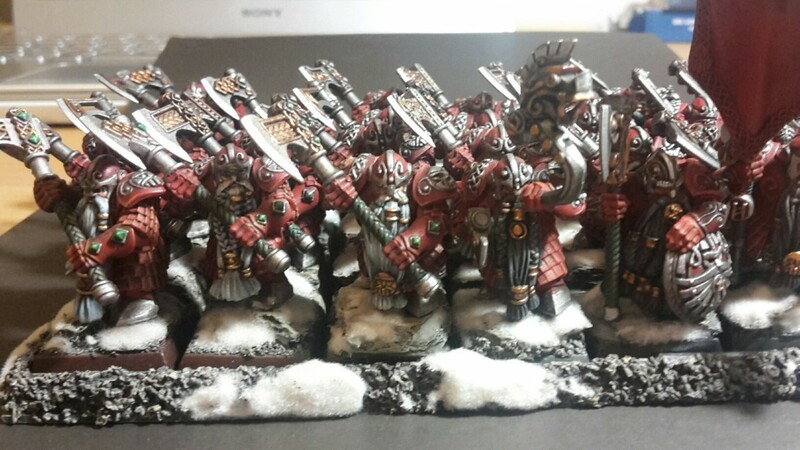 With Christmas arriving soon, I'll need to get another speed painting session done in order to complete the army on time! Would love a full army picture! 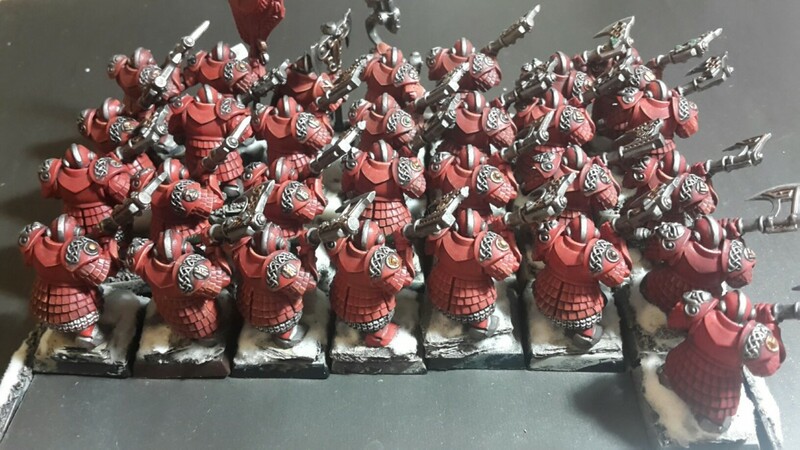 Another 20 Imperial Guard, this time the very nice 6th edition models. I am on the lookout for a command group so that they can be complete. I went for a rich blue for the uniform, I think it suits them well. 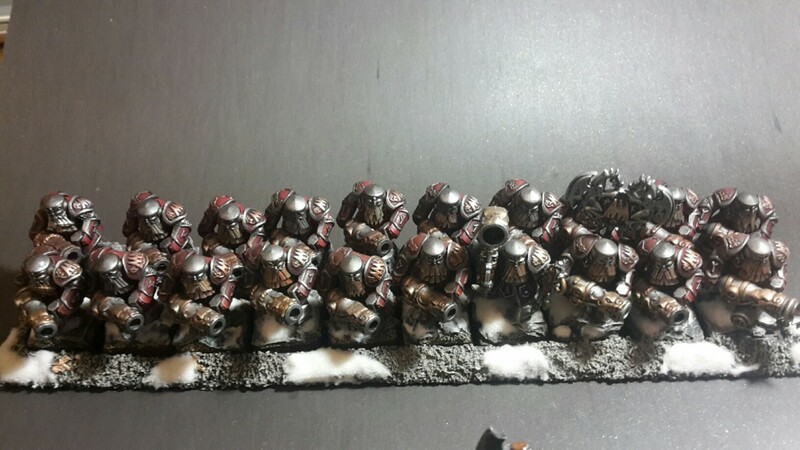 For the armour, I wanted them to look like veterans of many wars. So I opted for different metallic colours, to break the uniformity of the unit. As always, red feathers and muted colours will hopefully tie these together with the rest of the army. And with these units done, I'll call this army done. My brother will be receiving his present on Christmas day, and we'll hopefully get a game going to celebrate. - he needs to settle on a uniform colour for the other units, perhaps the same dark blue as the one on the greatswords. - Banners and small details. - Decals on the shields of the Men at arms. But for all intents and purposes, that's a "tournament ready" army of more than 4500 points, completed in less than a fortnight! 2018 will bring new challenges, namely my Dwarven Holds army and some more Dread and Sylvan Elves. Oh, and there's that Saurian army that I had painted back in 6th edition, that now looks seriously outdated. Not to mention the four thematic Highborn Elf armies that my brother has put together over the years. Or should I tackle the Vermin Swarm, or go mad trying? In short: stay tuned, lots of exciting stuff are in stock! Until the next time, Merry Christmas and a happy 2018. Thanks for following me in this adventure thus far! No rush! Im seriosuly impressed how much youve produced in such short amount of time! Everybody should get at least an army to this standard! So, Christmas has come and gone, and my brother received his gift! He was delighted, and now owes us some photos of the full army! During the holidays, I got the Warmaster bug: we played a game, and I was amazed by how well thought-out the game is. So it is possible that this blog will deviate somewhat to include smaller scale miniatures, if I can find them! 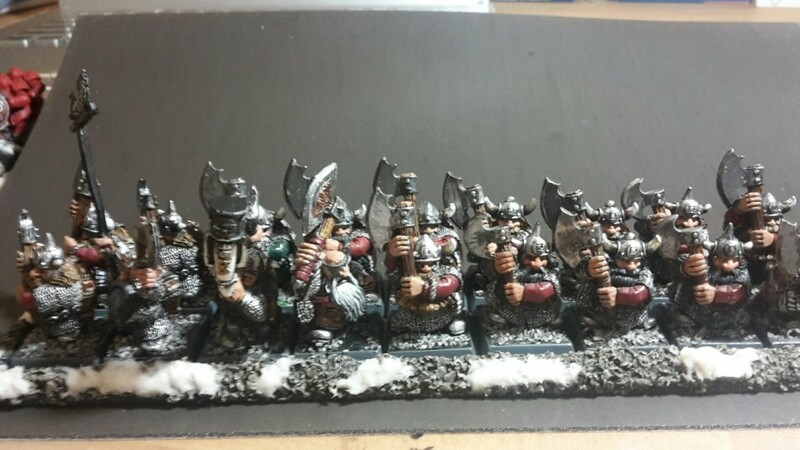 Touching up my 4th-5th edition dwarves, and painting up some of the nice 8th edition plastics! I'd started work on some of the models in December, and then there's a good part of models that I'd already speed-painted a few years back. So for now I'll focus on getting the army at a tournament-legal state, then touch up the older models as I go. Some photos to come tomorrow! The post was edited 1 time, last by SmithF ( Feb 6th 2018, 4:19pm ). Finally, I've started touching up some units that had been (badly) painted years ago. First on the list were Bugman's Rangers (Citadel miniatures, 90's era). I was too lazy to strip them, so I'll be reapplying colour and cleaning up the minis over the next few days. I started with the skin and the horns, then I'll be moving on to beards and the metallics. 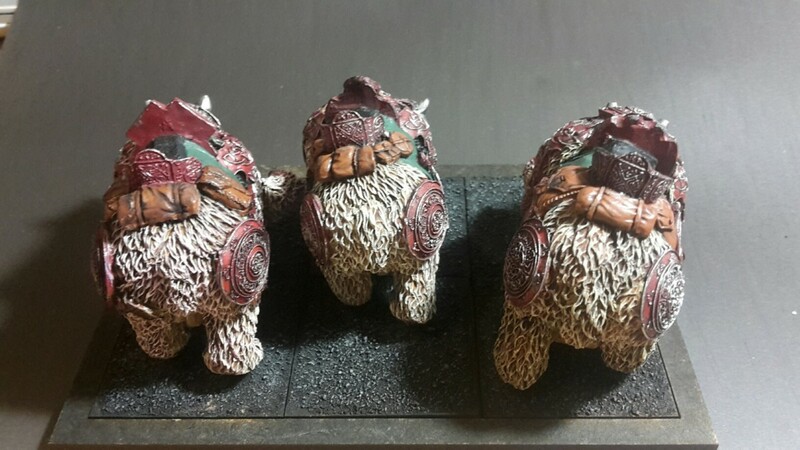 On a side note, I took the Dwarven Holds to a tournament last weekend, and my team collectively won best painted! While my stunties were not the most impressive army out there, I like to believe that they had something to do with the award anyway! U found out how the magnetic bear puzzle works? :D good job on the paints!